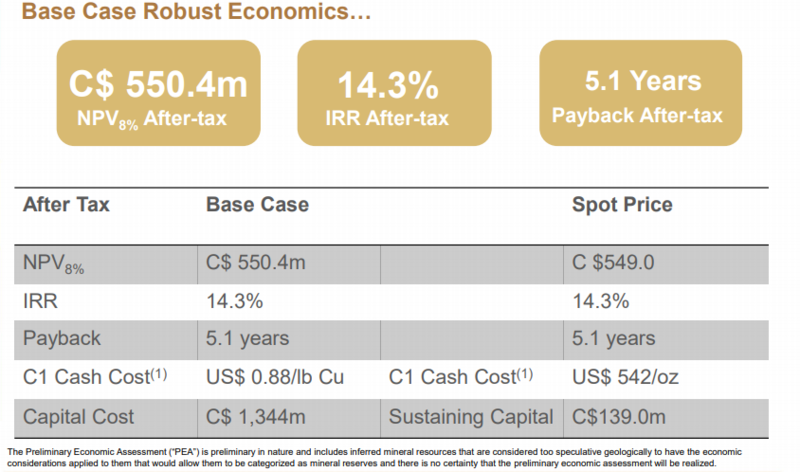 Northisle Copper & Gold: A 2 Billion Pound Call Option on Copper With A Gold Kicker | Energy and Gold Ltd. 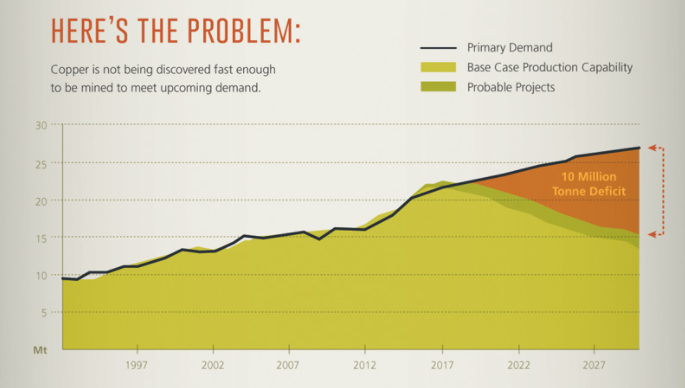 The long term supply/demand outlook for copper has probably never been more robust than it is now; much of global copper supply is currently derived from aging mines with declining ore grades while global economic growth (particularly from emerging market economies) and demand from electric vehicle production is just beginning to surge. Large scale permittable projects in safe jurisdictions are becoming increasingly hard to come by and we have been recently reminded of the politics of mining with Freeport-McMoran’s Grasberg Project in Indonesia and labor strikes in the large Chilean copper mines which punctuated much of 2017. $3.50+ copper is a stone’s throw away and NCX shares look particularly attractive considering the enormous valuation gap between NCX’s current market valuation and the potential value which would be unlocked by a positive production decision. Even an upward revaluation to 10% of its NPV(8) would make NCX shares a 5-bagger from current levels (development stage projects typically trade at roughly 10%-20% of the NPV outlined in their respective PEAs depending upon various project risks). Planning to add a director with a business strategy/marketing background. Sign a farm-out JV on NCX’s lower priority east side of the North Island Project (this would come in the form of an exploration expenditure commitment in return for a ~50% interest on a portion of the North Island Project) – this would be a significant positive because it would be a strong vote of confidence in the North Island Project as well as allowing NCX to complete more exploration work on the property than would have otherwise been possible. NCX summer exploration program focused on a high level alteration zone at the Red Dog Deposit and expansion of the Hushamu Deposit to the south. Continuing to improve the relationship with the three First Nations groups in the area, this includes community outreach meetings to help educate and familiarize the First Nations groups with the North Island Project and its long term economic implications for the community. McClintock says that NCX will carry out its summer exploration program beginning in May by drilling several targets which have been identified at the Red Dog Deposit. This exploration program has the objective of following up on promising targets which were identified during the 2016/17 exploration programs and should be able to be completed for less than C$250,000. To put it simply, at this point NCX is a 2+ billion pound call option on copper with a gold kicker. Over its estimated 22 year mine life the North Island Project is estimated to produce 82 million pounds of copper per year at an average cash cost of US$.88 per pound. It doesn’t take a rocket scientist to be able to figure out that this will be a very lucrative operation once it moves into production, it simply becomes a question of being able to justify the capex outlay required to build a mine. There is also the possibility of starting with a smaller scale mining operation which would require a much smaller initial capital outlay. The article is for informational purposes only and is neither a solicitation for the purchase of securities nor an offer of securities. Readers of the article are expressly cautioned to seek the advice of a registered investment advisor and other professional advisors, as applicable, regarding the appropriateness of investing in any securities or any investment strategies, including those discussed above. NorthIsle Copper & Gold Inc. is a high-risk venture stock and not suitable for most investors. Consult NorthIsle Copper & Gold Inc’s SEDAR profile for important risk disclosures. EnergyandGold has been compensated to cover NorthIsle Copper & Gold Inc. and so some information may be biased. EnergyandGold.com, EnergyandGold Publishing LTD, its writers and principals are not registered investment advisors and advice you to do your own due diligence with a licensed investment advisor prior to making any investment decisions.